Happy almost Mother’s Day to all those baby mamas out there who are crushing it. To the ones who are working hard to raise babies, punch time clocks, manage baseball practice schedules, and so on and so forth. You work it 365 days a year, usually without any thank yous, awards, or so much as time to enjoy an extra generous pour of wine during the witching hour. Mother’s Day is a day where, in an ideal world, you would get to do you. You could wake up, leisurely enjoy a cup of coffee, and maybe even nibble on one of these honey nut biscuits. There’d be flowers waiting at your bedside, and well behaved children would have already fed, groomed, and entertained themselves while you adjusted to the morning light. But let’s be real- the chances of that happening are slim. More than likely, there’s a dirty diaper or a Cheerios explosion waiting for you. There’s a dishwasher to unload, laundry to fold, and a few knees that will require Band-Aids. Motherhood is work. It’s exhausting and exhilarating all at the same time, and no matter how many books you read, mommy bloggers you follow, or packs of diaper wipes you buy at the store, it’s nearly impossible to be prepared for everything this life will hand you. Motherhood is the job you can’t clock out of, but it’s also the one with the most benefits. It’s a beautiful role we play, and despite how much I often disdain wiping one more nose, making one more bottle, or hearing “NO!” for the millionth time, I’ll always be honored to walk in these mama shoes. Even if they’re covered in baby food and spit up. 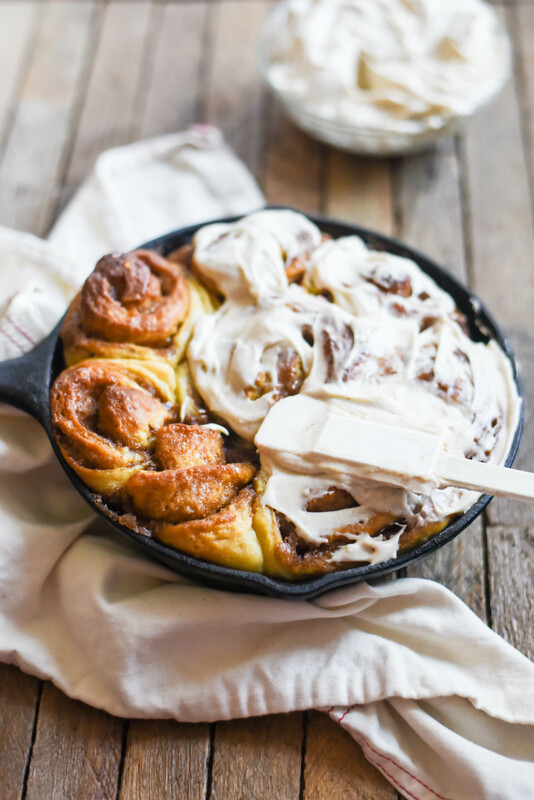 I’ve got just the thing to help you celebrate all the Moms you know- breakfast! Why buy Mom a gift when you can make her something entirely satisfying and delicious from the comfort of your own kitchen? Below you’ll see a few menus that I’ve put together based on a few different dietary needs and preferences. (Sidenote: Brett, if you’re reading this, I want the “Sweet Tooth” menu, ok?) 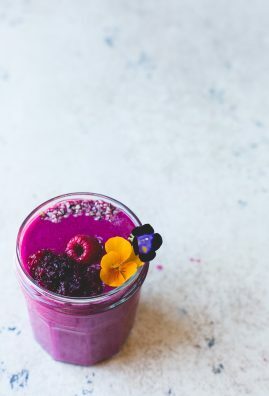 These are tasty recipes from some of my favorite blog friends, some of which I’ve tried, and others that I’m just dying to get to. Skim over the links and see if any suit you! And if you’re a Mama reading this thinking, “There’s no way my kids//husband//crazy landlord will be able to pull off one of these breakfasts for me on their own,” then I would charge you to make something delicious for yourself. You’ve earned it. For the lean, mean, protein-requiring machine moms who need a little muscle to make it through the day. For the moms who like their breakfasts like they like their children- SWEET. For the moms who don’t need to be told to eat their veggies. This category is basically for all of my Alabama friends who wouldn’t know a green smoothie if it sat on their face. Gals, if you make any of these, please invite me over. In addition, I’m sharing with you this most delicious recipe for honey nut biscuits. 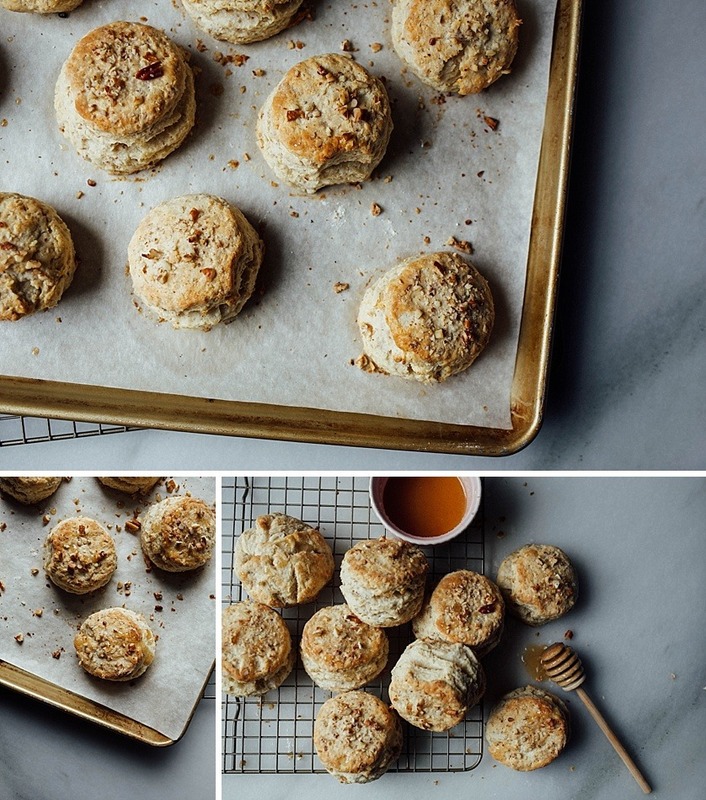 These are all butter, Southern-style biscuits, naturally sweetened with local honey and flecked with little bits of toasted pecans. Serve these with bacon and sausage, eggs, or maybe even just a pad of butter and a drizzle of honey. I promise that your Mama will thank you for it. 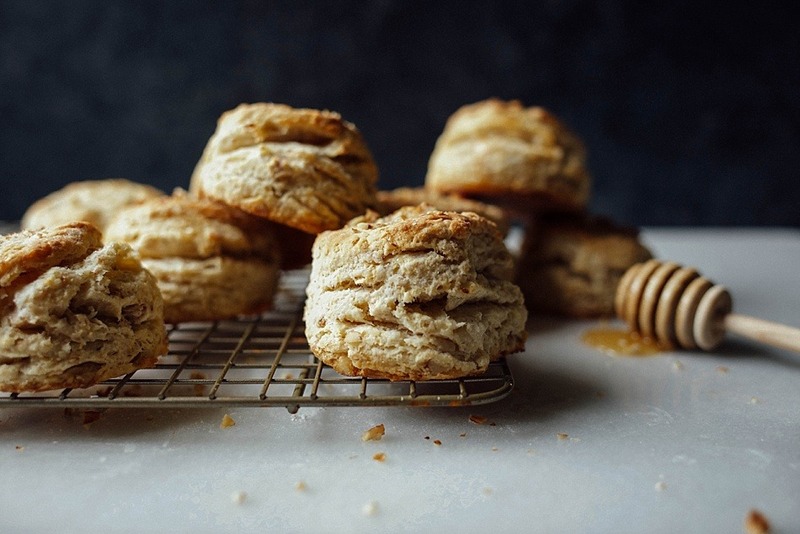 These biscuits are sweet, buttery, incredibly flaky, and almost too good to be true. Perfect for the mom in your life who needs all the thanks in the world. Give these honey nut biscuits a try on Mother’s Day, whether for yourself or for the special lady in your life. It’s good to share gratitude, and I can almost guarantee that the effort will mean the world to her. Happy Mother’s Day to my beautiful friends and readers who make this Mama’s life and world a little bit nuttier and sweeter. You guys are the best. Cheers! 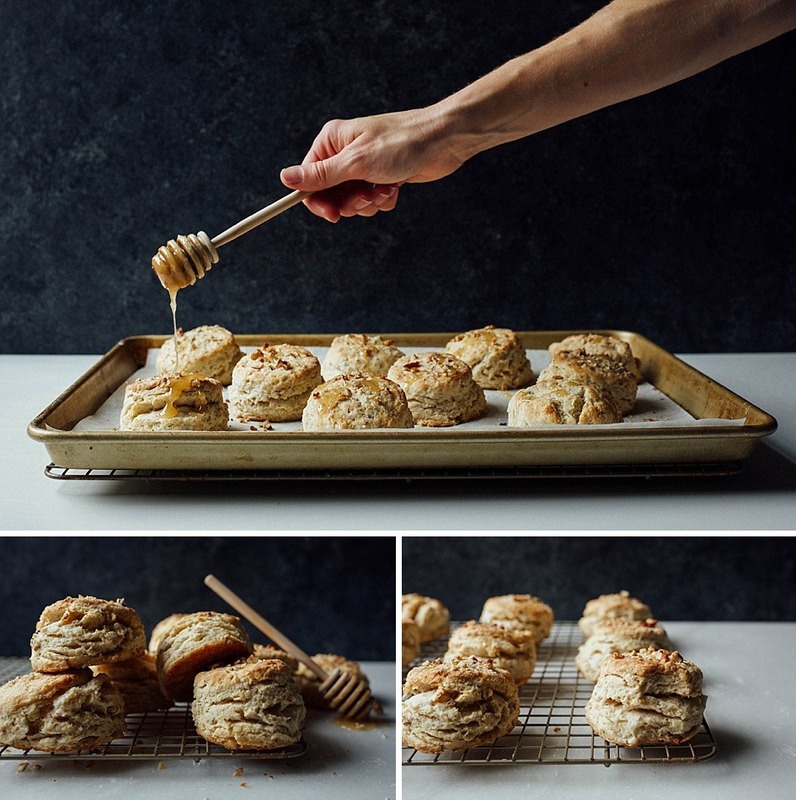 Sweetened with honey and flecked with toasted nuts, these honey nut biscuits are all-butter, flaky, Southern-style biscuits that are perfect for breakfast or brunch. Serve with additional butter and honey. Additional pecans for sprinkling on the biscuits, if desired. Preheat the oven to 415 degrees. 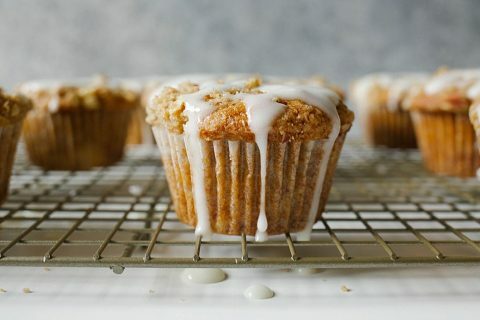 Prepare a baking pan by lining it with a sheet of parchment paper. Combine the flour, baking powder, and salt in a medium sized bowl. Using a pastry cutter or the backs of two forks, cut the butter into the dry ingredients until there are pea-sized clumps throughout. Toss in the pecans. In a small bowl or measuring cup, combine the milk and honey, stirring until well mixed. Add this to the flour and butter mixture and fold gently just until all of the flour has been moistened. Do not overwork the dough. Dump the dough out on to a floured surface and pat the dough out until it’s about 1″ thick rectangle. Working quickly, fold the dough in thirds, as you would a letter. Rotate the dough 90 degrees and repeat the folding process. Rotate the dough 90 degrees once more and repeat the folding process. Gently pat out the dough to 1” thick. 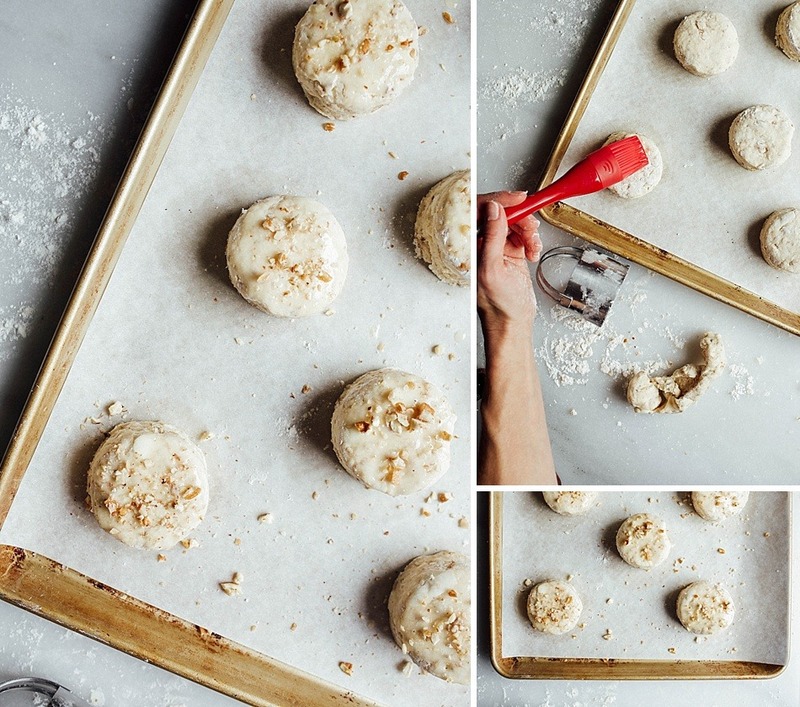 Use a 2″ round biscuit cutter to cut out biscuit rounds and place them on the prepared baking sheet. Gather dough scraps and gently pat them together to form another 1″ thick flat of dough and continue cutting out biscuits. 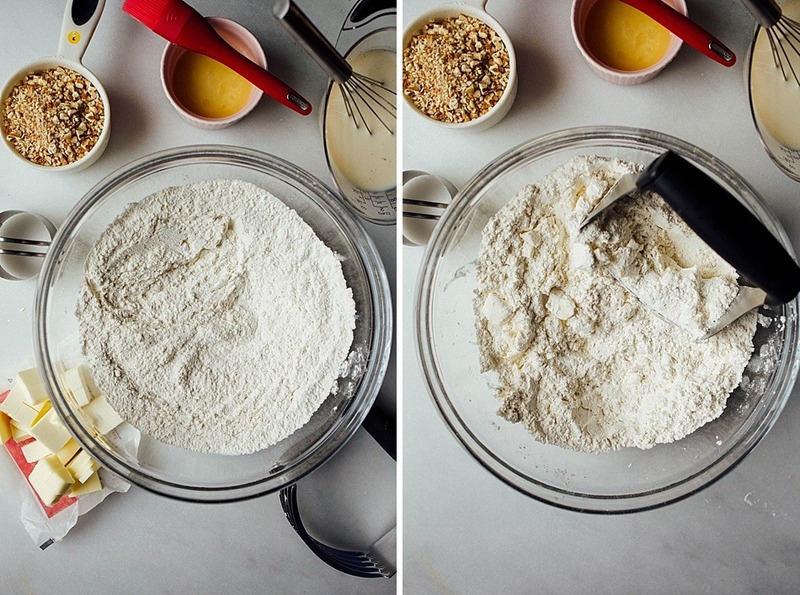 Take care to not overwork your dough, as this can yield tough biscuits. Brush the tops of the biscuits with the melted butter and sprinkle with additional chopped pecans, if desired. Bake in the preheated oven for 12-14 minutes or until the edges and tops of the biscuits are adequately golden. Serve buttered with additional honey, if desired. Be sure to use very cold butter and milk. Butter and milk that is not cold enough can prevent your biscuits from rising well. Do not overwork your dough at any phase of the preparation. The folding of the dough helps to create flaky layers within the biscuit, but is not necessary if you don’t care about this. For flakiest layers, use a sharp biscuit cutters and push straight down into the dough. Refrain from twisting the cutter as you insert it into the dough as this can cause the edges to seal off and keep from rising well. You can substitute walnuts, almonds, or another preferred variety of nut for this recipe, if desired. You can substitute additional melted butter with heavy cream or milk. To reheat biscuits, toast in a toaster oven until fragrant. oh hooray! I’m just thrilled to hear that! So many times I read a recipie and I want to see if people made it and liked the recipie so I thought since I like to read reviews I should leave one. First of all I love your blog! Your food is beautiful! I originally found you from Instagram and King Arthur flour I think. I saw this recipie on Instagram one day and immediately thought of my husband! He loves Pecans so I made it for my family’s special Saturday Breakfast this morning and everyone loved them! They were tender and my husband said he particularly loved the textural aspect the pecans added to the biscuits! So thank you for sharing this beautiful recipie and it was worth making! We will be making these again sometime soon! Thank you for sharing! Literally, nothing makes me happier than hearing than to find that someone has a bit of success with my recipes. I’m so glad you enjoyed them. 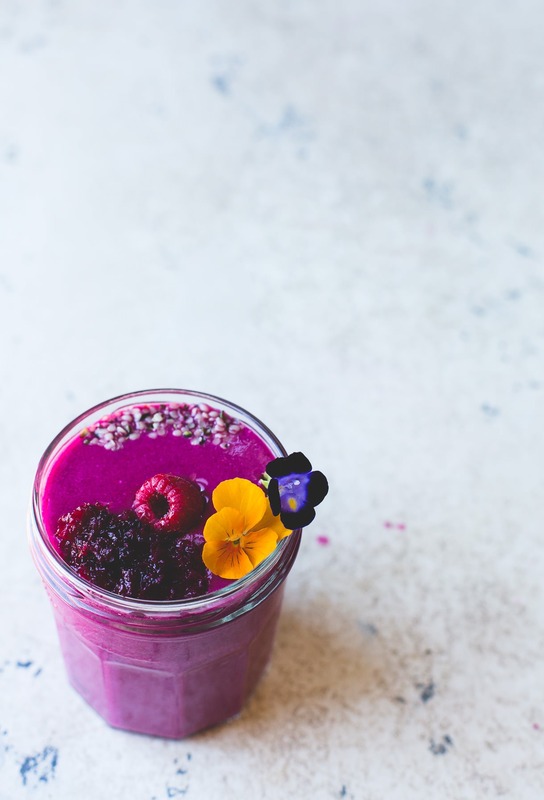 So honored to be included in your beautiful roundup! Those biscuits sound AMAZING! Those are some BEAUTIFUL biscuits, Kate! Since my dog hasn’t mastered biscuit-making yet I’ll have to make them for myself this Sunday :). Have a great week! And I hope you get your sweet tooth menu this weekend! Have a terrific week yourself and thank you for stopping by! This is such a cute post! Love your menu ideas – if I wasn’t 1000 miles from my mama I’d totally be making one of them! 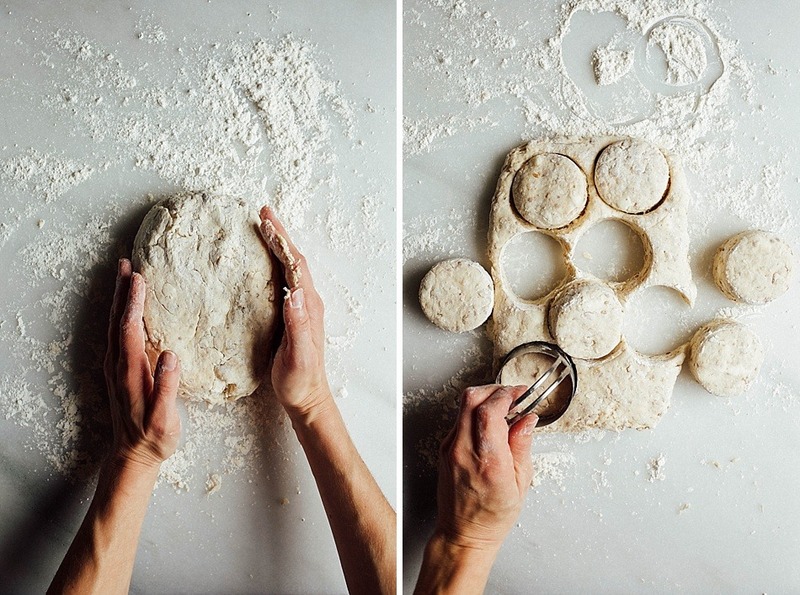 These biscuits look so good- def adding them to my ‘can’t wait to make’ list! Kate, these look amazing! Those flaky layers have me drooling. Happy Mother’s Day! These sure do look tasty Kate! Biscuits are my hubby’s favorite morning food and the added sweetness of honey with the nuts is sure to be a hit for us. 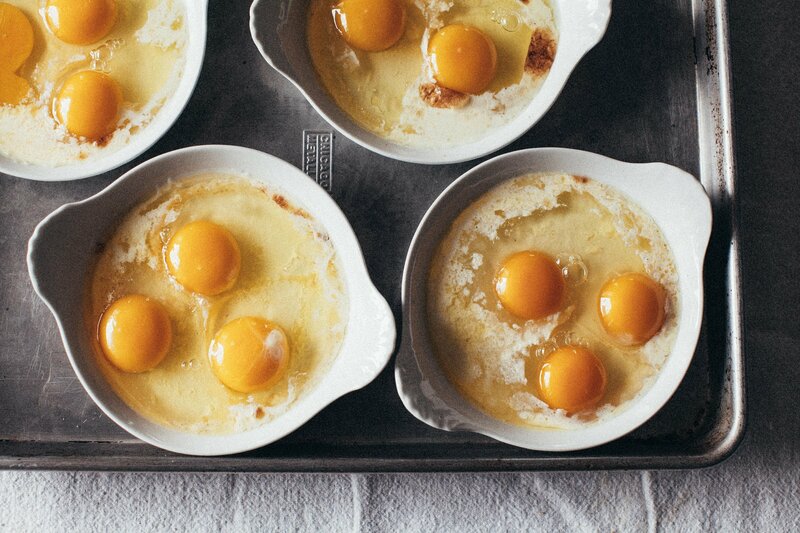 Wonderful idea of adding some maple syrup, I like! This recipe will be made as soon as I buy my pecans. I’m so glad you’re going to try it! Biscuits are my hubby’s fave too, and so any time I can spice it up a bit and make something exciting I’m always pumped. Let me know what you think about these!! Beautiful words! The biscuits sound delicious and will be gracing my table on Mother’s Day (or sooner)! Happy Mother’s Day Kate! I love the combination of the nuts and honey in a delicious biscuit!